If you are simply going to overrule election results that you don't like, why bother with the pretense of even having elections? I'm looking at you communist China. Hong Kong recently held local elections and the results were simply dismissed. Activists accused Beijing of crippling Hong Kong's parliament Friday after four pro-democracy lawmakers were disqualified. More than 1,000 people protested near the government offices Friday night in response to the decision. The High Court judgement came as a massive blow for the democracy movement as it means the balance of power in the partially elected legislature swings further to the pro-China camp because opponents do not have enough seats to veto bills. Former Umbrella Movement protest leader Nathan Law was among those barred in a case brought by the semi-autonomous city's Beijing-friendly government after the four changed their oaths of office to reflect frustrations with Chinese authorities. Law was one of several rebel lawmakers to secure a foothold in parliament at citywide elections in September. But that triumph was soon jeopardised [sic] after Beijing issued a special interpretation of Hong Kong's mini-constitution in November to insist oaths be taken in a "sincere and solemn" manner. 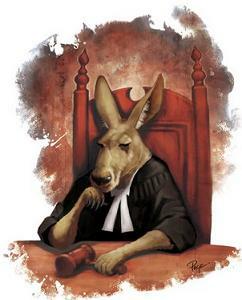 That's one way to run a kangaroo court; just be obvious about it.